Click here to see published story in CapeCodToday.com. 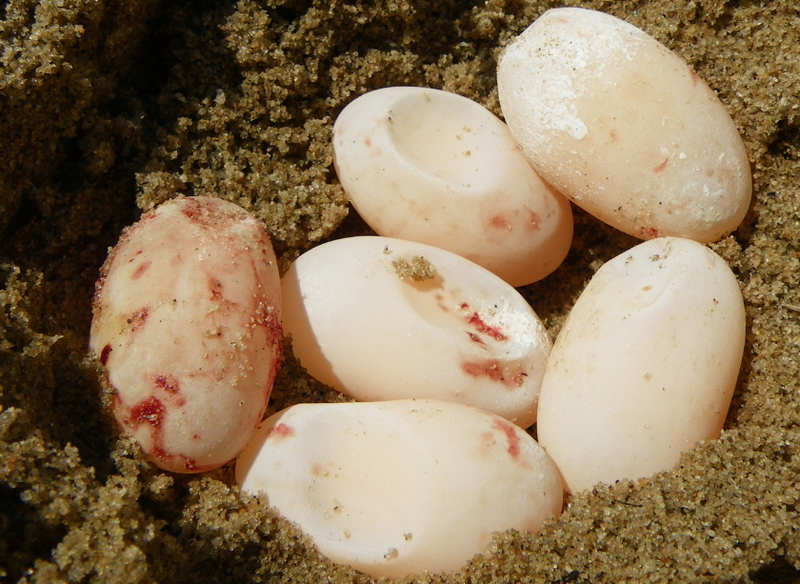 Crushed shell, blood caked wounds, dehydrated body, and exhausted, a young female turtle collapsed over her finished nest that now held 14 beautiful pinkish eggs and the future of diamondback terrapins in Wellfleet. Without a large, powerful brain to convince her the situation was hopeless and to rationalize failure, this terrapin fought through pain and impossible odds to protect her offspring. “Neither angst nor doubt,” the turtle motto, proved key to achieving success when any smart thinking mammal would simply have given up. I guess that’s the reason turtles survived the dinosaurs and have racked up 250,000,000 years of design success. Wouldn’t it be wonderful if humans could adopt a few of their environmental survival skills. As I walked toward Turtle Point Saturday morning, a young boy called out excitedly from the Agger cottage. Tyson had been vacationing with his New York City parents for the last three weeks and had become familiar with Lieutenant Island as the nesting epicenter for diamondback terrapins in New England. He watched as they crawled ashore from Cape Cod Bay to find nesting spots all over the island from deserted dunes to rustic one-lane dirt roads and driveways. Eight-year-old Tyson gained a graduate level education in conservation biology in a few weeks of summer of adventure. “Hey, Turtleman! She’s hurt. Real bad. Bleeding. She needs help. I saw her on the road. Run over.” He spurted out words through clenched emotions. Tyson’s dad explained they had found a terrapin on Marsh Road Extension near some partial nest digs on Friday night. 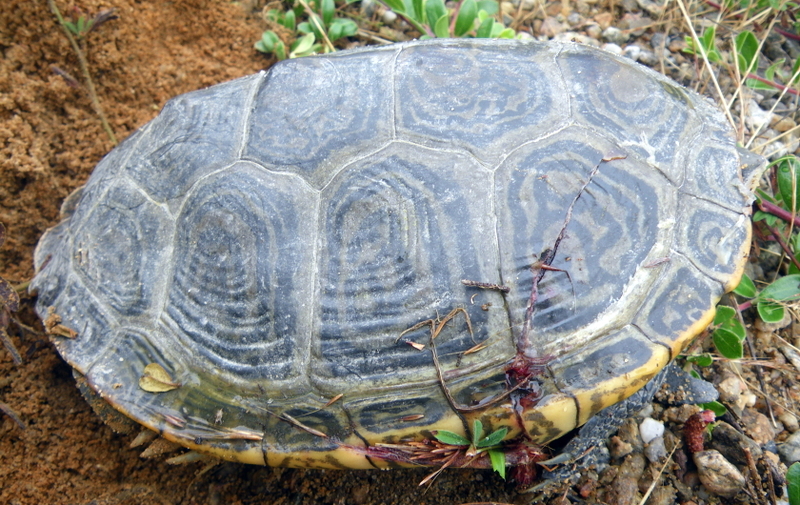 The turtle had been run over, its shell cracked and bleeding. 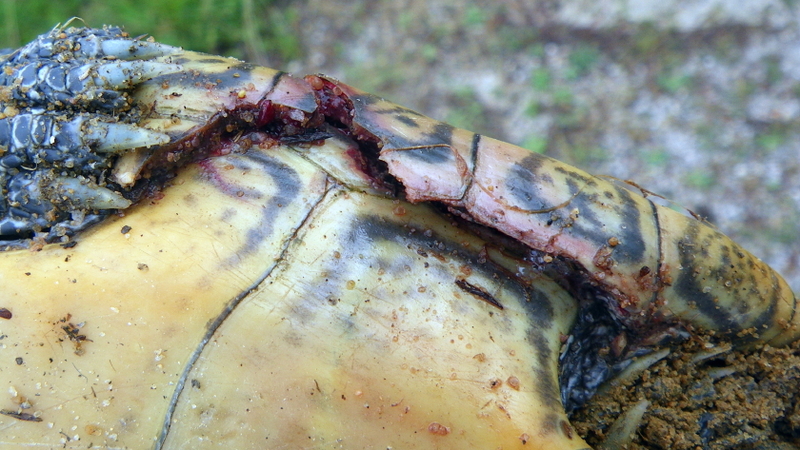 Tyson wanted to help the turtle; he begged his dad to put band aids on the wounds. Dad took Tyson home to settle him down, and when he returned to check out the turtle it had disappeared. “It probably crawled somewhere to die,” he said. I promised Tyson I’d search for the injured animal. Thirty minutes later I found her draped over a newly completed nest. Her carapace had large lateral cracks on both sides as a heavy vehicle had completely run over her. Despite the strong architectural design of the turtle shell, the force had crushed and broken the supporting bridge that holds together the top and bottom shells on both sides of her body. The breaks in her shell sported weeds and grass stems from where she had dragged herself to hide from predators over night. 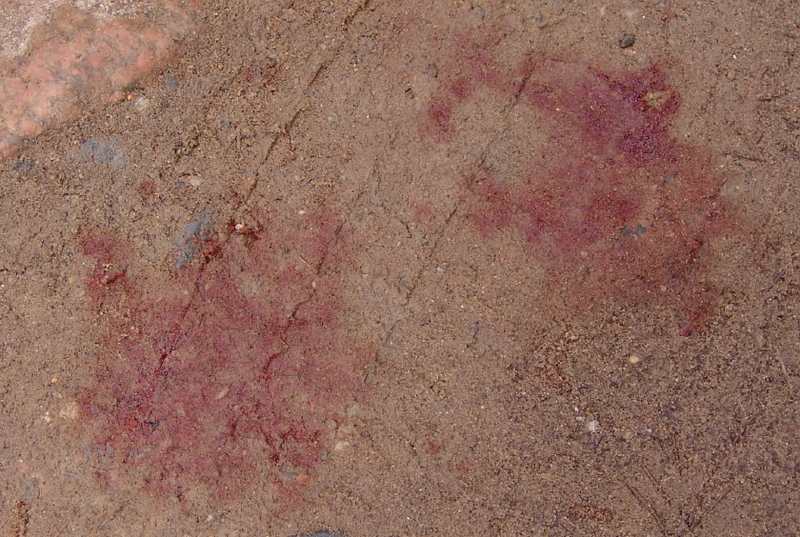 Her bleeding had congealed, but she felt light as air from exhausted dehydration. Thankfully, her strong shell repelled enough of the vehicular weight to prevent fatal organ damage; it had protected the integrity of her spinal column as all limbs continued to function normally. I tracked her by following scrapes in the compacted road and driveway. She had abandoned several tries because the ground was simply too hard to penetrate. Her last and successful attempt cut through a layer of gravel and heavily compacted parking pad soil until she reached softer sand where she could hollow out an egg chamber for her babies-to-be. Rear limbs that bear the brunt of digging were worn raw scratching through chipped gravel. She had covered the nest with every bit of sand she could find and tapped down the soil to protect her clutch. Now she lay motionless. This turtle had been marked #2728 when we first saw her in July 2006. We had last observed her on June 25th when a group of kids found her basking on the flooded Lieutenant Island causeway as she prepared to embark on her first nesting run of the year 23 days ago. We immediately cleaned her wounds to prevent infection and rehydrated her. Since her nest lay in such a vulnerable location, a parking pad, we relocated her eggs to a safe, sandy dune where we covered them with a predator excluder. We wanted to do our part to compensate for what humans had already done to her and to protect these babies she had fought so hard to save. Thanks to this little bit of extra “scale tipping,” the odds that her eggs would become turtles increased from a meager one in a thousand to better than one in ten. The lost of mature, breeding females to a threatened species, such as diamondback terrapins, is a terrible blow to their recovery. Because of the cold, late spring, turtle nesting was delayed on Cape Cod by a week to ten days, pushing peak nesting into the 4th of July weekend. The result was more than a dozen squished turtles that were run over by heavy summer traffic on the Outer Cape. The impact on a late maturing, long-lived and diminishing population like turtles can be devastating. 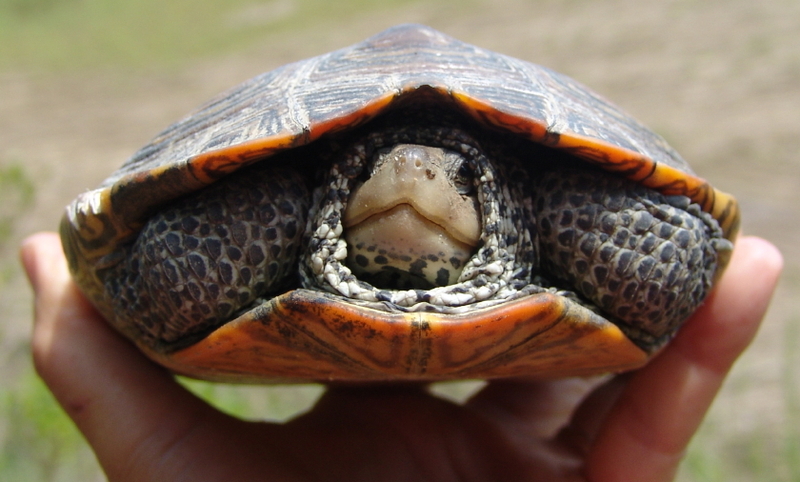 It takes a mature female terrapin twenty to forty years of full reproduction to replace just herself. 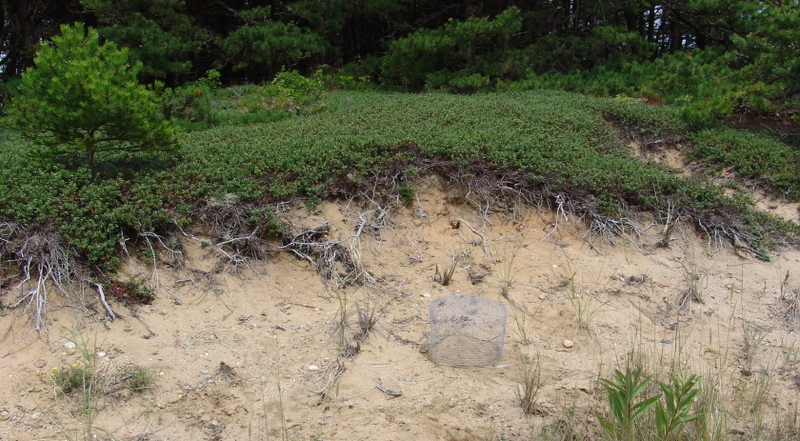 Losing a dozen mature females in a single season will have a negative impact on the Wellfleet Bay population for decades. With a bit of turtle TLC, Terrapin #2728 snapped to life and by mid afternoon she headed back into the healing salt marsh channels of Wellfleet Bay. 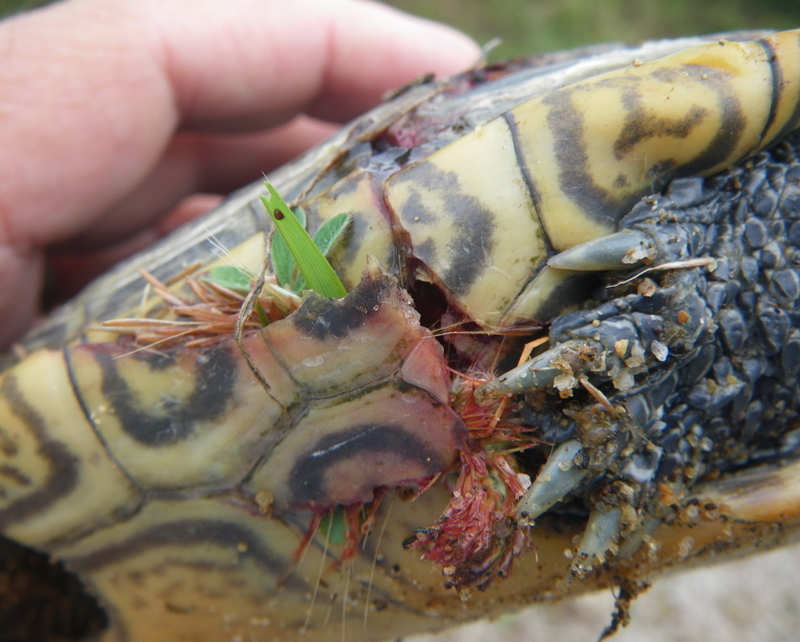 We have recorded injuries similar to hers throughout our three decade longitudinal study of terrapins on the Outer Cape. Having survived the initial trauma without loss of limb function, she has a good chance of recovery. If humans can be even a tad more vigilant in such an environmentally sensitive area as Lieutenant Island, she may survive long enough to bring terrapins back from the brink of extinction. Her potential babies incubating under the warm sands of Turtle Point will have their say about the future of the species, too … if humans give them a chance. While responding to the deadly incident on Lieutenant Island on July 3rd (see Two Tragic Turtle Accidents on Lieutenant Island), the Turtle Journal team rescued a very young female terrapin on her very first nesting run. She crossed the road at nearly the same spot as the two mature turtles that were run over a few minutes earlier. Female terrapins on the Outer Cape reach nesting maturity around 8 or 9 years old when they reach a mass of 625 to 650 grams. Captured for the first time, Terrapin #9754 measured 15.45 cm straight-line carapace length and 14.2 cm plastron length. She weighed 651 grams. Based on our 30 year longitudinal study of terrapins on Outer Cape Cod, we know this sized turtle would be nesting for the first time. She was removed from busy holiday roads of west Lieutenant Island along with four other more mature female terrapins, all of which were moved to isolated Turtle Point for a better chance to nest safely. While the other four scooted into the marsh for safety and upland areas in search of an appropriate nesting spot, Terrapin 9754 immediately began to dig a nest directly in front of us. She thrust her nose into the sand, tossed some dirt over her shell with her front limbs, then moved her rear legs into the shallow pit to begin digging her nest in earnest. We were able to document the entire nesting process and found very interesting how much of this process is driven by instinct rather than behavior learned over time through practice. She dug her nest, deposited her eggs and danced the final camouflage steps to cover and disguise the nest location. Terrapin 9754 dropped from 651 grams to 591 grams after nesting. 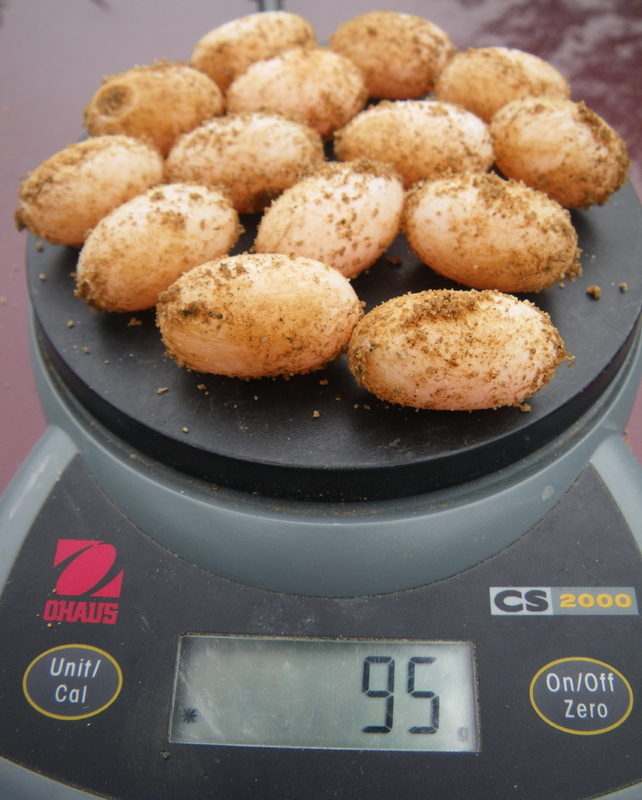 To complete the scientific package, we harvested the eggs which measured about 3.1 cm long and weighed about 5.6 grams each for a total of 56 grams for all ten eggs. The eggs were returned to the nest and covered with a predator excluder to protect them while they incubate in the warm Turtle Point sand. The Turtle Journal team will be watching Nest #132 very carefully around Labor Day Weekend to get a peek at her first live hatchlings. Stay tuned to Turtle Journal (www.turtlejournal.com) for the rest of the story. For a conservation researcher, the death of a single mature female in a threatened population is painful. The needless crushing of two nesting females within 50 feet and 50 minutes of each other by Lieutenant Island drivers on Friday morning ranks beyond tragic. It is devastating to the affected species and it doesn’t say anything postive about the effecting species, either. The first turtle was run over by a driver that continued on his way, then was moved to the side of the road by a bystander who assumed she was dead. Her carapace was split open with blood oozing every where; yet she clung tenaciously to life. While the Turtle Journal team sped her to Wildcare in Eastham for emergency treatment, a second female turtle was crushed to death at nearly the same spot. According to witnesses, a commercial fuel truck making a delivery to a cottage on the second island ran over her on its way out. 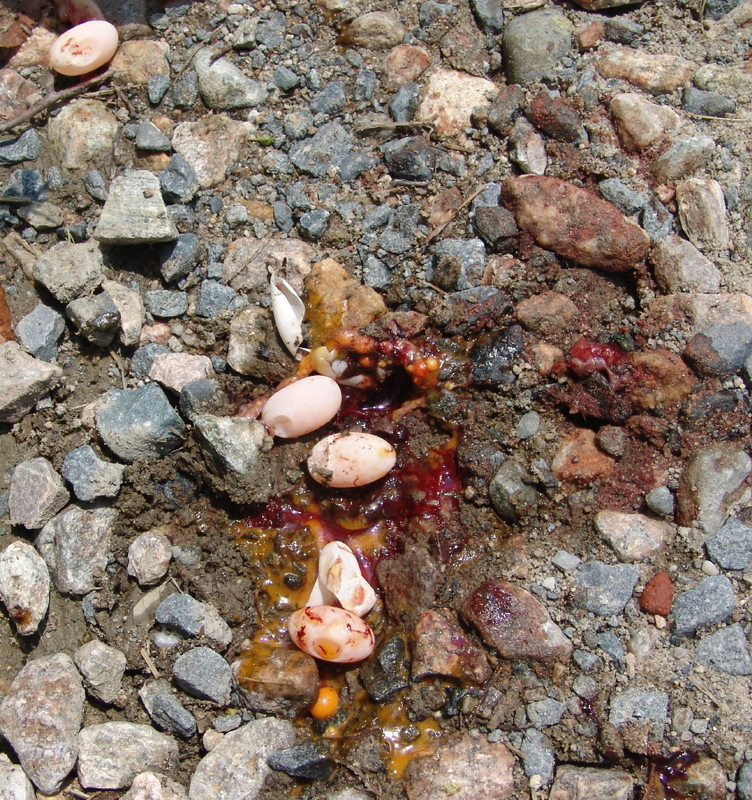 She was crushed so badly that the center line of her carapace split open and eggs squirted across the road. 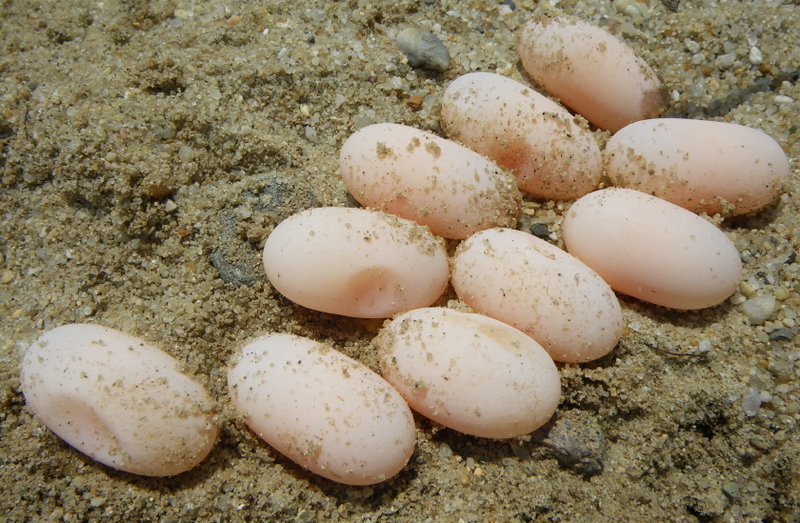 Fully encased first clutch eggs that she was about to lay, as well as unfertilized eggs for her second clutch which she would have laid in another 17 days, were scattered across the roadway. An island visitor sobbed as we removed the carcass and harvested the eggs. Even the thought that we would try to save her DNA by incubating and protecting six potentially viable eggs we salvaged did little to abate the tears. 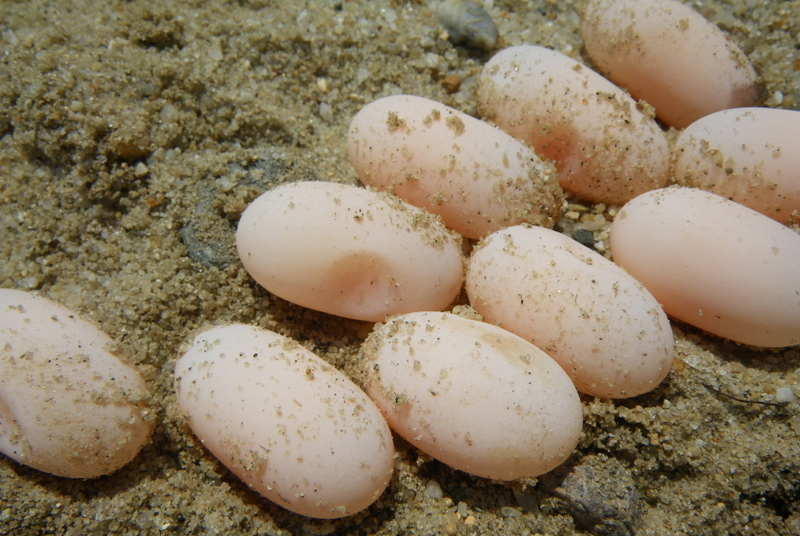 Due to high egg depredation and huge mortality of the few hatchlings that emerge, it can take a mature female two to four decades of continuous nesting just to reproduce a replacement for herself. Turtle reproductive strategies grind exceedingly slow, which makes it so difficult to restore populations declining under the pressure of human influence. The loss of breeding females, that are not plagued by a biological clock to limit productivity as they advance in years, and that actually produce more viable hatchlings as they age and grow; the loss of these female terrapins to the population is simply tragic and unsustainable. Two other female nesters were killed on Indian Neck roads on the other side of Blackfish Creekd, another road fatality was found today near the dike on Chequessett Neck Road, and at least one other was squashed while on a nesting run in Eastham. This year has proven a bad season for nesting terrapins. 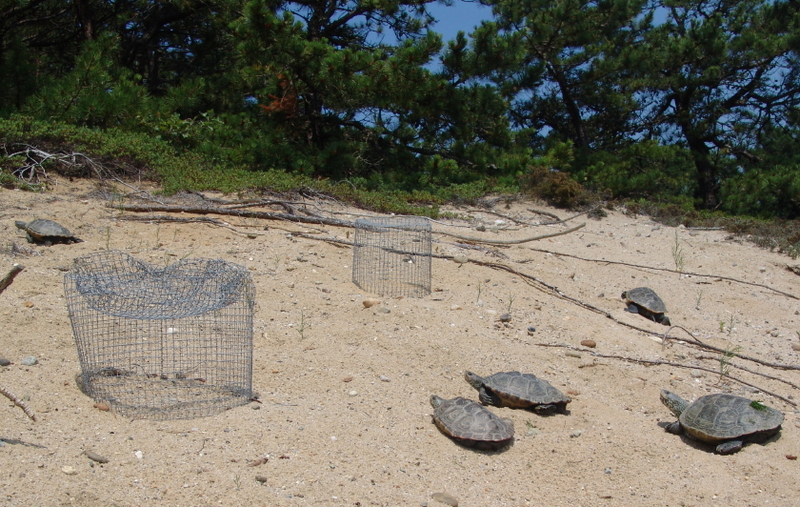 Reports have been filed for eight or nine diamondback terrapins run over on the Outer Cape, mostly in Wellfleet, so far this nesting season … with the second clutch nesting runs yet to commence! The first turtle is being treated at Wildcare where they will attempt to save her, and at the very least, to harvest her eggs for incubation. When we examined her at the scene, she still had function and response in each limb. The crack to the carapace did not extend across the vertebral. So, we are hopeful, but realistic. Such damage takes months and months to repair … if ever. Yes, when you’re in the field with Turtle Journal, there’s always good news to balance the bad. At the scene of these two terrible accidents, Sue collected several other female terrapins on nesting runs amidst the July 4th weekend traffic. We moved them to a much safer location before more damage could be done. 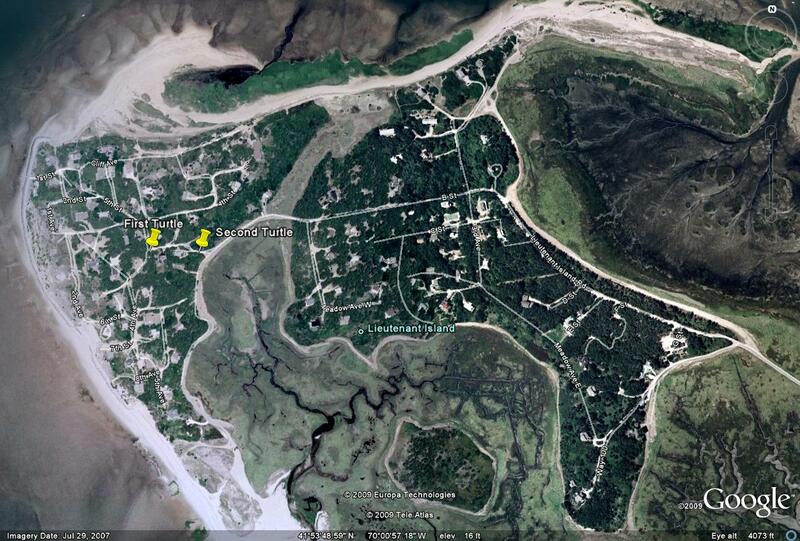 One of these ladies was a young turtle that came out of Wellfleet Bay for the very first time to deposit her eggs. While our 30 year longitudinal study has allowed us to identify first time nesters, this one was the first such first time nester that we found en route to her nest. We took precise weights and measurements to tease as much scientific data as possible about this rare event. Then, when we moved her to a safer location out of the press of vehicular traffic, she immediately began to dig her nest and lay her eggs right in front of us. We videographed and photo-documented the entire event, and we were able to acquire even more data on her eggs and on her body weight after she laid them. Because we don’t want to draw tonight’s post out too long, we will save the rest of this upbeat story for the next posting. Stay tuned! 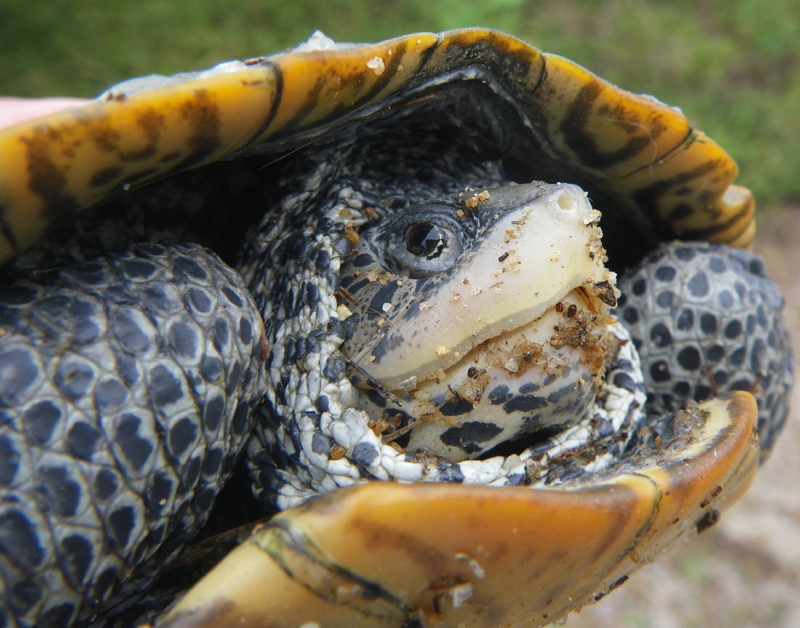 You are currently browsing the Turtle Journal blog archives for July, 2009.